This St. Patrick’s Day, we’d like to share the incredible, heartwarming story of a stray kitten named Shamrock who found luck on the streets of New York City. 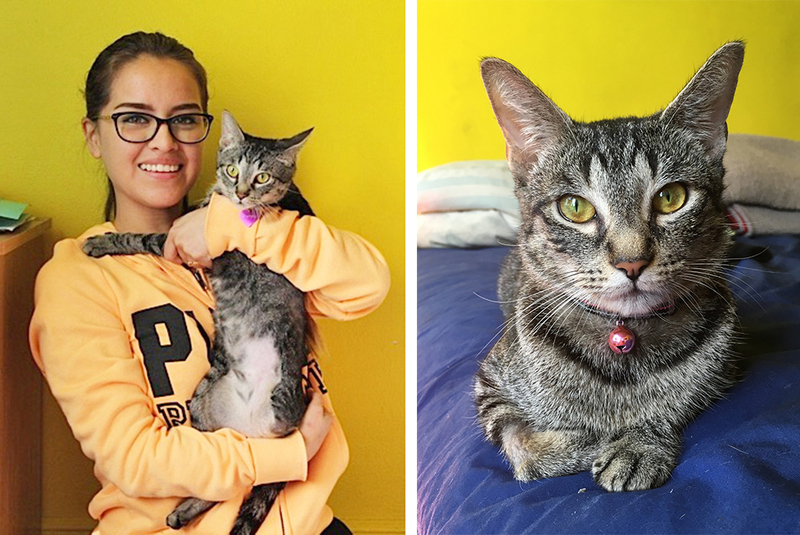 When Carmen A. and her children noticed a kitten limping kitten on a pathway near their home in the Bronx, New York, they took action and brought her back to their home. It was then that the family—who has four cats and two dogs of their own—saw the kitten’s injury, which left muscle, tissue and bone exposed. “She looked like she was split open,” said Carmen. 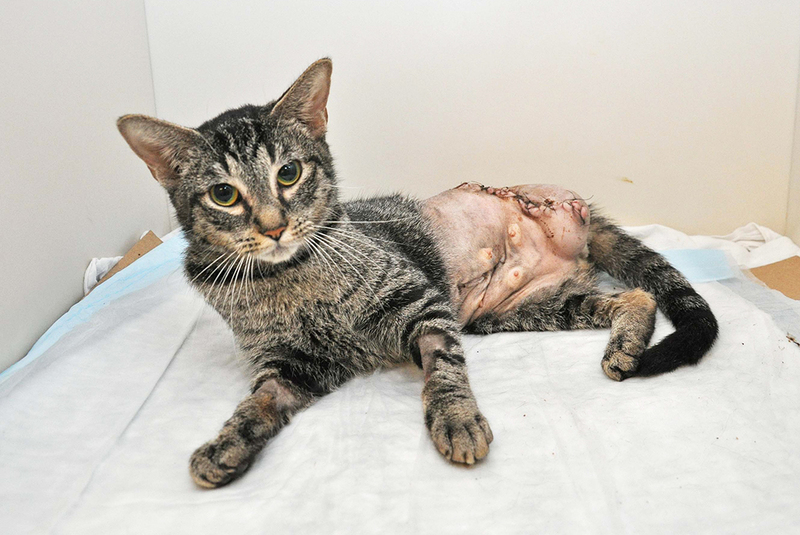 Carmen’s family rushed the six-month-old tabby to the ASPCA Animal Hospital, where despite the tennis ball-sized hole in her left side, the cat remained calm, ate the food she was offered, and even tried to stand up and walk. At the Hospital, veterinarians determined that Shamrock had an open fracture on her left hind leg that required amputation. She also had bones in her stomach—a common consequence of foraging for food in trash bins and dumpsters—which required surgical removal. Shamrock also underwent a spay procedure. Despite her ordeal, Shamrock was friendly with ASPCA staff, especially Mercy Alvarado, an ASPCA Animal Care Technician who spotted her the day after her surgery. 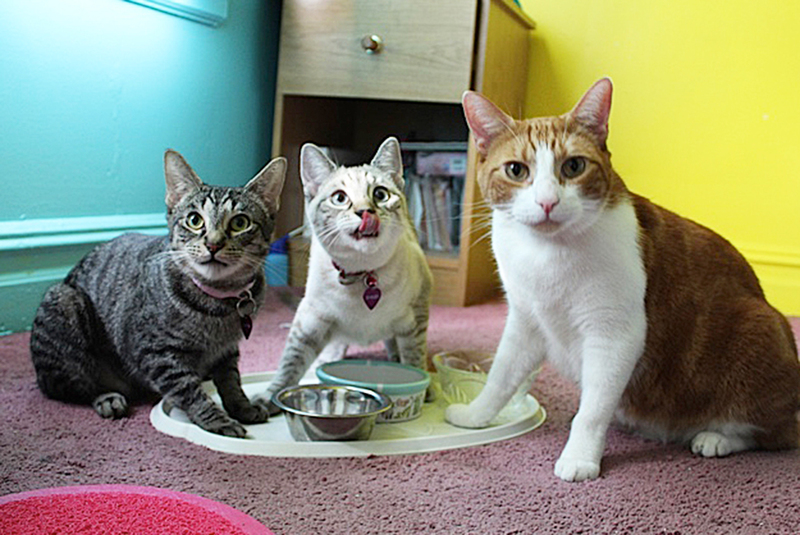 Once Shamrock recovered from her operations, Mercy officially adopted her (she calls her Shammy for short), and took her home to Queens, New York. Shamrock gets along well with Mercy’s resident pets, which include a young female Siamese mix named Luna, a male white-and-orange tabby named Ginger and a female pit bull named Bella. Shamrock is also coping quite well with three legs. Mercy doesn’t consider Shamrock a “special needs” cat by any means.